Thirty secondary school children from across the Borders hotfooted it to Philiphaugh on Wednesday for a special skills camp run by rugby sevens specialists Scott Wight and Mark Robertson. The former Melrose pair now ply their trade around the world for the Scotland seven-a-side squad – and if there’s anything they don’t know about the game, it’s just not worth knowing. And they are looking to impart that information to the players of tomorrow. Wight told us: “It’s basically giving an insight into the game of sevens. We thought it would be a good idea to come back to the Borders and give something back, show them what we are now doing as a job. “The kids today have participated in some small sided games with some skills and this afternoon they are doing a gym challenge with some speed times. And Robertson added: “They seem to be really enjoying it. We’ve fortunately got a really good group, they are all really keen. “The skills they are practicing here are very important in sevens ... you need to be able to pass with both hands, you need to be able to offload, and your agility and one-to-one skills are so important. “If they practise these things, they will get better at them and it will transfer over to XVs. The dynamic duo is targeting early secondary school lads with prior experience of rugby. Wight said: “This is the kind of key age where you learn your skills, we need to get these skills into their game as early as possible so they know what they have to go work on when they go back to their schools and clubs. Robertson explained: “In the abbreviated game, with fewer players, the ball is in their hands so much more. 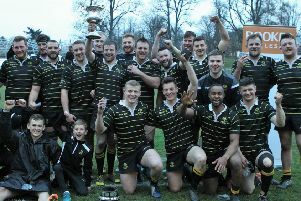 Wight and Robertson are looking at branching out to hold similar sessions in Aberdeen and Edinburgh, and in the fullness of time, they hope to be able to hold interdistrict sevens tournaments throughout the summer in the three venues.